The Soyuz rocket is raised into a vertical position on the launch pad, Monday, March 19, 2018, at the Baikonur Cosmodrome in Kazakhstan. A pair of U.S. astronauts and one Russian cosmonaut are just two days away from launching on a 50-hour, 34-orbit flight to the International Space Station. Flight Engineers Ricky Arnold and Drew Feustel will flank Soyuz Commander Oleg Artemyev inside the Soyuz MS-08 spacecraft and blast off Wednesday at 1:44 p.m., EDT, from the Baikonur Cosmodrome in Kazakhstan. 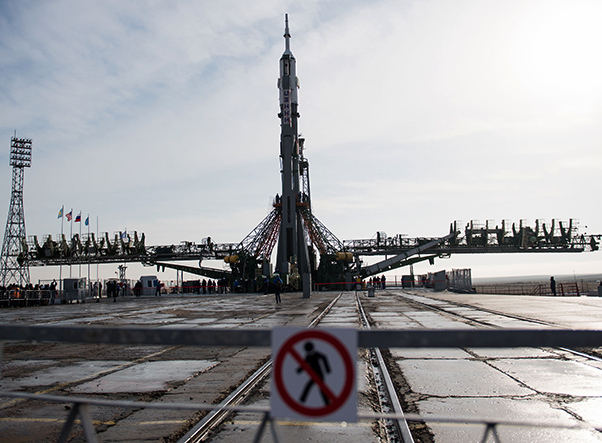 Workers are seen on the launch pad as the Soyuz rocket arrives after being rolled out by train, Monday, March 19, 2018, at the Baikonur Cosmodrome in Kazakhstan. 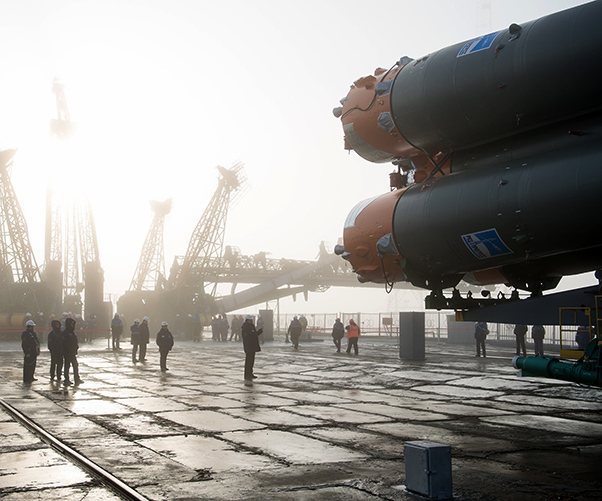 Expedition 55 crewmembers Ricky Arnold and Drew Feustel of NASA and Oleg Artemyev of Roscosmos are scheduled to launch at 1:44 p.m., EDT, March 21 and will spend the next five months living and working aboard the International Space Station.